With the holidays coming up and socializing in full swing, Learn to Respond Appropriately flahcards offer children the skills to be successful in their interactions in various situations. There are 32 photographic images of social situations and the back of each card has the appropriate response. Examples include what to say on the phone, asking for a turn, expressing affection, commenting on events and more. 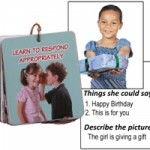 Save 15% this week only on the Learn to Respond Appropriately cards by entering the Promo Code BLOGLRA11 at checkout. *Offer expires on November 29, 2011 at 11:59 pm EST. Not compatible with any other offer. Be sure there are no spaces after the Promo Code when you enter it at checkout. Written by: Different Roads to Learning on November 22, 2011. This entry was posted in autism, autistic spectrum disorder, Difflearn Promo Code, Pick of the Week, Products, Resources, Sale, Social Skills and tagged autism, autism education, conversational skills, daily routines, Different Roads to Learning, generalization of skills, language development, learning, Resources, social skills, teaching tools by Different Roads to Learning. Bookmark the permalink.